Noah Wilson poses with his first Band-Aid bin — one he made himself and put on his front porch. Within two days, the bin was full. It was the start of what would become the nonprofit called Noah’s Bandage Project. OVERLAND PARK — Seven years isn’t considered a long time. It’s not even enough time to graduate from medical school or for a space satellite to reach the planet Uranus. But for Noah Wilson, son of Sacred Heart, Shawnee, parishioners Deb and Scott Wilson, seven years was long enough to have made an immense impact on his three siblings, classmates and family — and to continue impacting thousands more today. This impact was not born from an easy life. 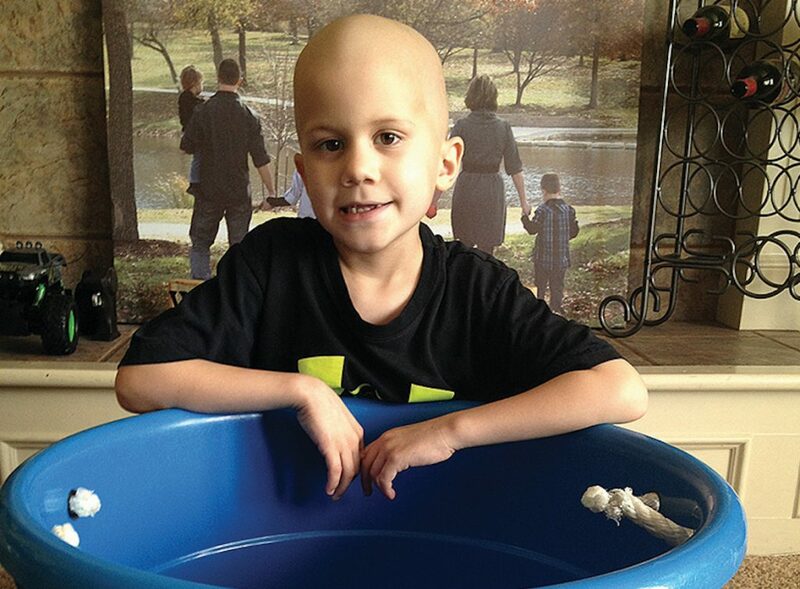 On Good Friday of 2014, after complaints of an aching back, 6-year-old Noah was diagnosed with Ewing’s sarcoma, a rare form of cancer. In fact, Ewing’s sarcoma is so rare that only 200 diagnoses occur in the United States each year. Doctors at Children’s Mercy Hospital (CMH) had found a tumor encircling a section of Noah’s spine and immediately began chemotherapy radiation. Though relieved each time the day’s treatments concluded, Noah was disappointed that the hospital only offered plain bandages — a poor reward for bravely facing the day’s medical treatment. He wanted cool bandages — and knew that the other children in the hospital felt the same way. One day, Noah’s mother Deb found he had emptied out his toy bin and placed it on the front porch with a sign asking for fun bandages for the children at CMH. “The neighborhood saw it and within a day or two, the bin was full,” said Vernon. For Noah, cool Band-Aids were more than bandages. They were badges of courage in the face of intense and painful medical treatment, a mode of self- expression amid appearance-altering illness. Little did Noah and his family know at the time, but that day was the start of something much bigger. It began what would become the nonprofit called Noah’s Bandage Project (NBP). A website for NBP was formed shortly after Noah’s first front porch Band-Aid drive and, by summer 2015, NBP had collected enough bandages to make their first delivery to CMH. But bringing fun bandages to sick children wasn’t as easy as it first seemed. CMH’s policy limited it to procuring bandages through its own channels, not allowing for bandage donations. But that didn’t stop the Wilsons from donating bandages to patients as they left the hospital as well as to Ronald McDonald House. That is, until CMH caught wind of NBP and the demand for fun bandages — which led the hospital to update its buying policy to include them. With one in 285 children under the age of 20 diagnosed with cancer every year in the United States, NBP knew it had a mission to support cancer research in addition to uplifting pediatric cancer patients’ spirits. According to the National Pediatric Cancer Foundation, only four percent of federal government cancer research funding goes to studying pediatric cancer. And since 2016, NBP has given two $100,000 grants to CMH and have established a $1 million pediatric cancer research fund in Noah’s name. NBP has also collected well over five million individual bandages that have been donated locally and internationally — and they are always in need of more donations. NBP has even garnered support from the Kansas City Royals, Noah’s favorite sports team. But Deb and Scott are quick to remind supporters that children suffering from cancer need support in many ways in addition to the support NBP provides. “There are a lot of Noahs out there starting missions for socks, pajamas and all sorts of stuff,” said Deb. “If you can change a hospital and their ordering policy with bandages, that’s pretty amazing. One of NBP’s main community fundraisers in support of pediatric cancer research is the Noah’s Crown Town 5K, which is approaching on April 27. Funds from the race will directly support pediatric cancer research, and the race will take place at Corporate Woods in Overland Park. Participants are encouraged to bring boxes of Band-Aids to donate on the day of the race as well. While Noah beat Ewing’s sarcoma, he contracted a violent secondary cancer — acute myeloid leukemia (AML) — through his chemotherapy treatment in May 2015. The AML weakened Noah’s system rapidly. On June 30, 2015, Noah’s illness reached the peak of its gravity. “All day long, we never left Noah’s side,” said Scott. “We were singing along with him . . . and praying the rosary. And surrounded by those prayers and the people who loved him, Noah passed away into the arms of his Savior. The most notable feature about Noah, however, was not his creating a nonprofit, his love for the Royals or even his sufferings with cancer. It was his faith in Christ. “[D]espite everything,” said Scott, “he was able to say, ‘Thank you, God. You’ve given me so much, and I love you.’ That’s Noah. Noah loved St. Michael and attending the School of Religion (SOR) at his parish. One of his proudest moments was his first Communion. Noah also was known as the peacemaker and an encourager, from within his family to the hospital. “I met Noah when I was in the hospital,” said 16-year-old Brittany Kistner of Lathrop, Missouri. “I had a feeding tube,” she said, “and wasn’t dealing with that very well. “He had one, too. He came over and talked to me and helped me get out of that rough patch. And Noah continues to positively impact others today — especially his family. “[My experience with Noah’s illness] has been the overwhelming awesomeness of God,” said Candace Wilson, Noah’s grandmother and a Holy Family, Eudora, parishioner. Moreover, Candace and Vernon both said it was their faith that helped them through Noah’s illness and continues supporting them now. “The Catholic Church was phenomenal in support of our family during this time,” said Vernon. “Nobody can go through this without God,” agreed Candace. The race will start and finish next to Building 40. Visit the website at: www.noahs crowntown5k.com and click “Register Now” at the top of the page.